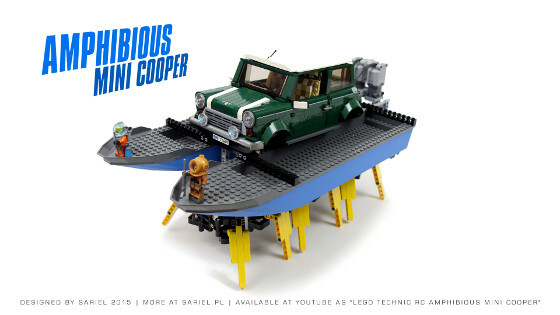 A walking/floating mod of the Lego Mini Cooper set. 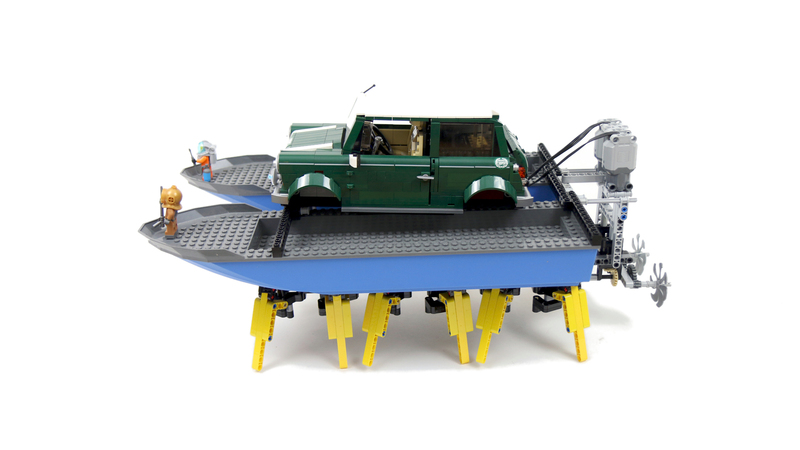 Features 12 moving legs and 2 propellers for movement in and out of water. 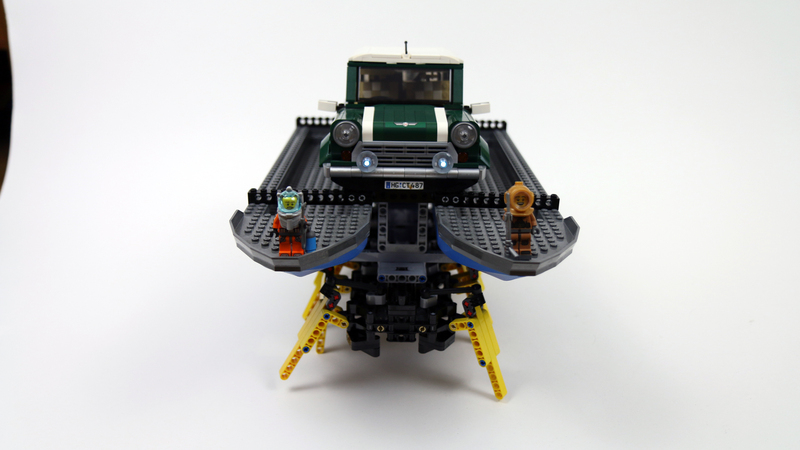 I have a history of modding the Lego 10242 Mini Cooper set, first with a tracked and then with a walking version. 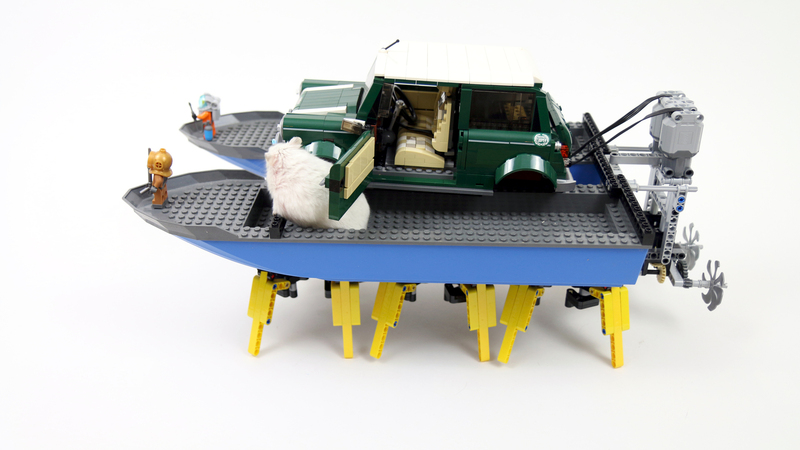 For a while it seemed like I couldn’t come up with any new mod, as making the Mini simply float on water was just too simple. 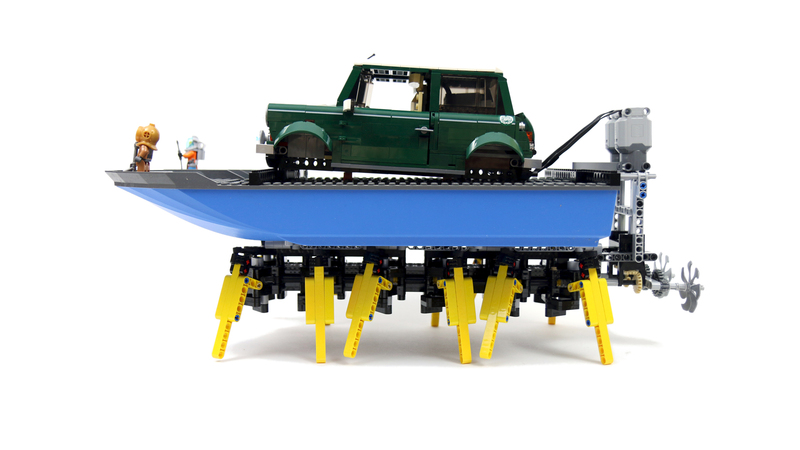 Then I realized that my walking chassis is technically waterproof if driven by motors located above the water, and next the natural step was to install that chassis under some boat hull with the Mini Cooper on top of it. 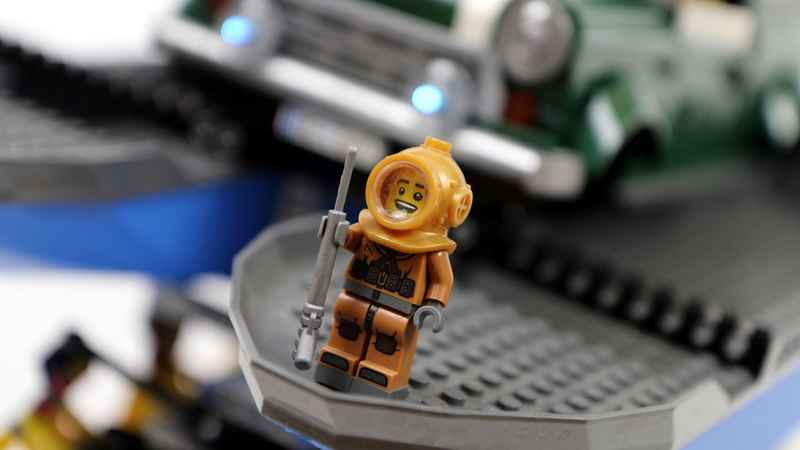 My first choice of the hull was that from the Lego 60095 Deep Sea Explotation Vessel set because it looked really fitting with the Mini on top, but unfortunately it proved unable to support the weight of both the Mini and the walking chassis. I have therefore ended up using two #54100 hulls which didn’t look so well. 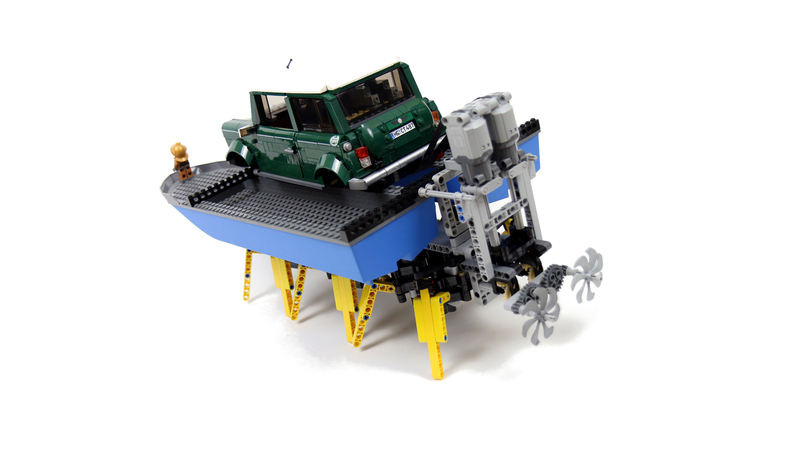 The resulting vehicle was pretty heavy and the walking chassis was on the very brink of its load capacity. 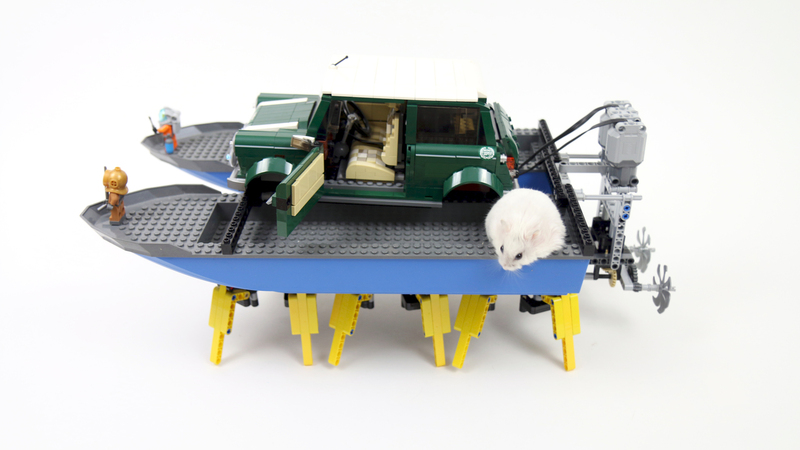 Despite its crude, simple construction and generally wacky concept, the vehicle proved to work as expected – when tested in gradually filled and emptied bathtub, it could go from walking to floating and back seamlessly. It was pretty sluggish when floating due to two small propellers, but it remained perfectly stable and controllable at all times. Oops! 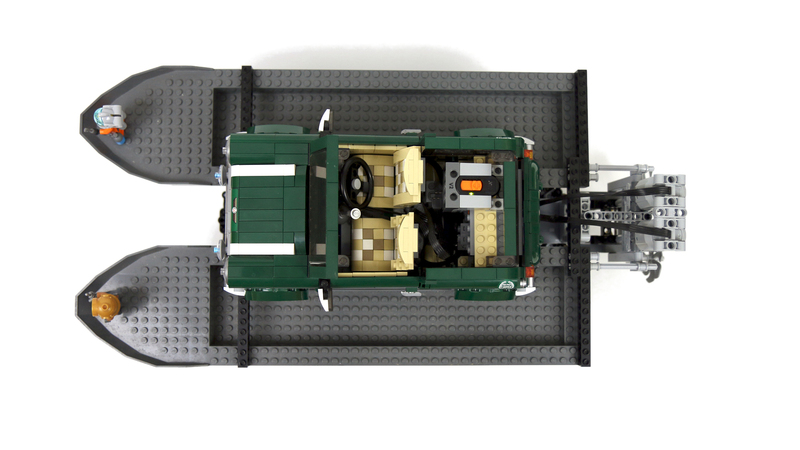 I didn’t realize that the chassis’ instructions were already available! Thank you! I want to race three Technic racecars that can jump, get good speeds, and be controlled by a single IR receiver. A Big Thank You i managed to make it rotate by rebuilding only the crane as there were many foolish people who told me to rebuild my entire gear box. You being a gamer which gaming mouse would you recommend to buy, is Razer ,Roccat or Logitech good to buy or any other brand that you can recommend. You must have made a building error somewhere, the only solution is to go back to where you started building the crane and build it again. Hi Sariel this christmas someone gifted me Lego Technic 42043 Arocs, I have already made it but the only problem is the crane of the truck is not turning properly do you what can the problem is. Can you help? Also when the monthly workshop video will be released. How about a racecar that can jump? 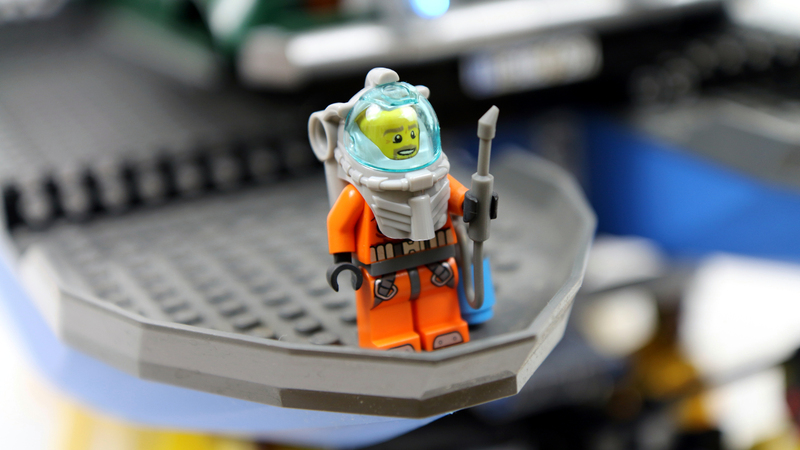 I haven’t seen one made of Technic. Could you do another racecar? And if you do, PLEASE do instructions! Hey Sariel Wishing you a very very HAPPY BIRTHDAY and MERRY CHRISTMAS to you . So where’s the party tonight man and what are you getting on this special day. With the Mini Cooper, everything is possible. Next Idea: a stretched (elongated in the middle) one (which, if you strech it enough, would even offer room for RC and maybe an extra function… 😀 ). I’ve used GoPro 4 cameras: Session and Black Edition. That’s actually an interesting idea 🙂 It’s a shame the Mini is kind of heavy-ish. Nice mod ,one day you should definitely make the flying mini cooper. I am planning to buy a Lego technic set tell me is the Arocs Truck good or can you suggest me any other set which is good. Which underwater camera did you use? 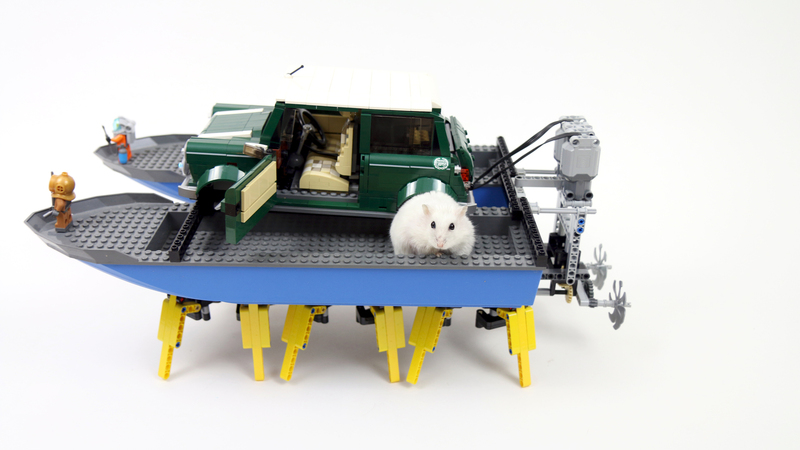 And my Super Mecha hamster will be ready by December 24 a very special day for you I guess.